Download "Implementing Guided Pathways at Miami Dade College: A Case Study"
1 CASE STUDY / MARCH 2015 Implementing Guided Pathways at Miami Dade College: A Case Study Systemic Change at Miami Dade In 2011, working groups from across the eight campuses of Miami Dade College (MDC) conducted a wide-ranging examination of why many students were not completing their programs. These groups identified a number of reasons for student attrition. Students were unclear about how to progress through programs they had too many course and program choices, did not understand program requirements, and needed help in developing academic and career goals. Also, advising information given to students was unclear and inconsistent, and academic support was disconnected from academic programs. 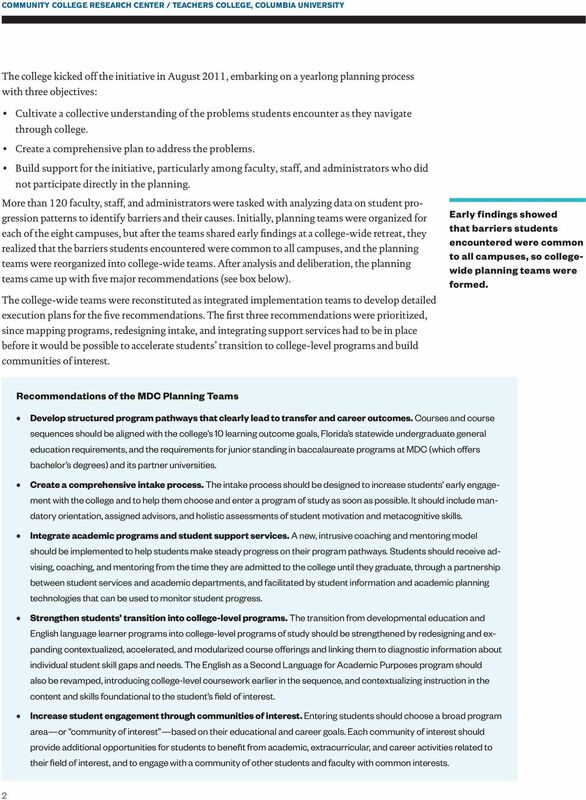 These realizations provided the impetus for a comprehensive college-wide effort to redesign programs and supports so that students could more easily navigate college and achieve their goals. While implementation is not yet complete, and student completion data are not yet available to gauge the impact of the changes undertaken, more than half of the college s faculty and staff are now involved in various aspects of the endeavor. This case study describes the strategy MDC used to engage faculty and staff in this wide-ranging reform effort. 1 This case study is part two of CCRC s guided pathways practitioner packet. 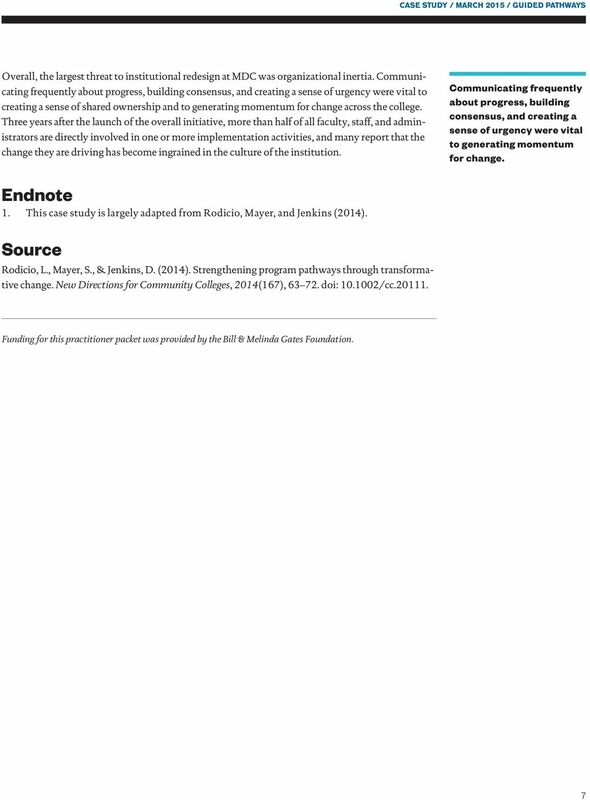 It is adapted from the article Strengthening Program Pathways Through Transformative Change, by Lenore Rodicio, Susan Mayer, and Davis Jenkins, published in New Directions for Community Colleges, no. 167, fall For an overview of research supporting the guided pathways model, see What We Know About Guided Pathways (part one). 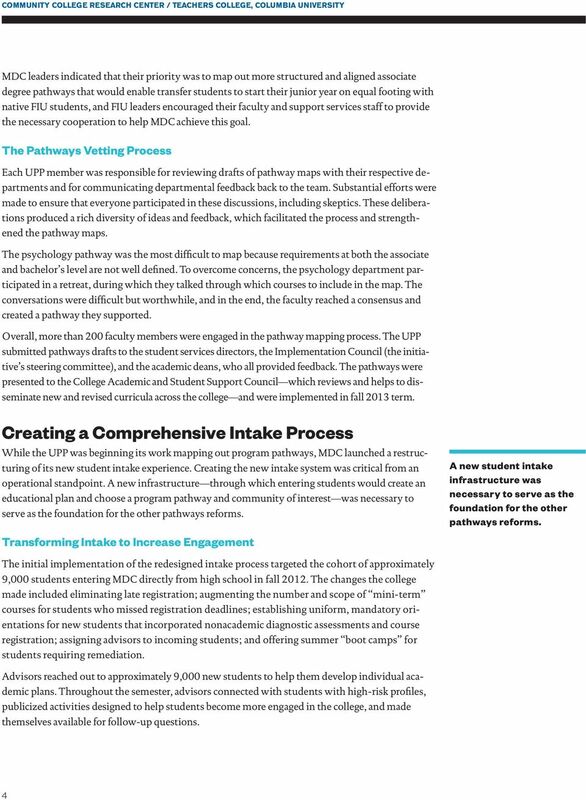 For practical guidance on implementing guided pathways at your college, see Implementing Guided Pathways: Tips and Tools (part three). The Planning Year In 2011, the college launched a major new initiative to strengthen pathways to degree completion, facilitate transfer to baccalaureate programs, and support students advancement in the labor market. 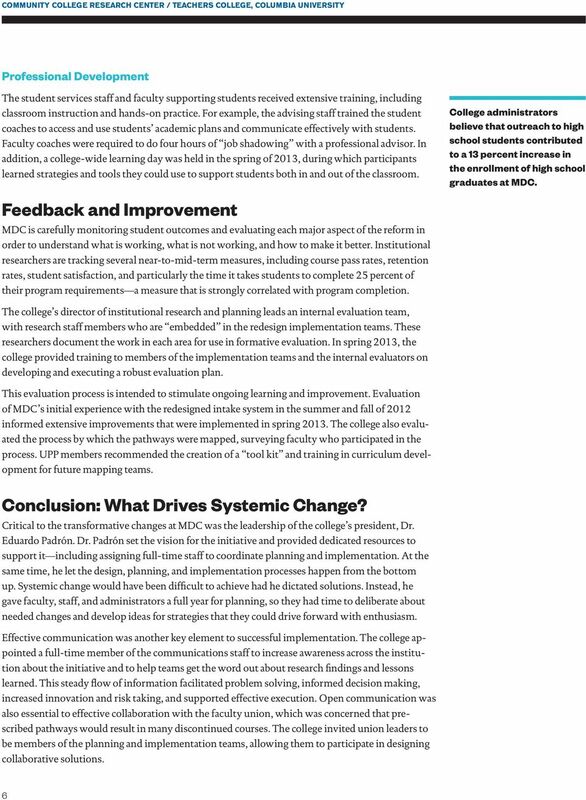 Because previous small-scale, incremental innovations had not substantially improved student outcomes at MDC, the goal from the onset was systemic change. College leaders understood that broad, institution-wide change could only be achieved if faculty and staff led the process of identifying problems, developing solutions, and carrying out results-oriented action. Previous small-scale innovations had not substantially improved student outcomes at MDC, so the goal from the start was systemic change. BUILDING MIAMI DADE COLLEGE'S STUDENT PATHWAY: A 3-TIERED ADVISING MODEL O HIO A SSOCIAT ION OF C OMMUNITY C OLLEGES (OACC) 5 TH A NNUAL FALL S YMPOSIUM, S PRINGFIELD, OH, NOVEMBER 14, 2014 JOAQUIN G.
Change Management and Guided Pathways: Creating a Plan for Implementation at a Washington State Community College. Ontario Leadership Strategy Leadership Succession Planning and Talent Development Ministry Expectations and Implementation Continuum Contents 1. Purpose 2. Why Succession Planning and Talent Development? VALERIE WARD MARTINEZ 8060 165 th Avenue NE Redmond, WA 98052 425-558-4224 vmartinez@nwccu.org SUMMARY Experienced community college administrator with experience in single and multi-campus environments.